It’s that time again – the anniversary of the day Jean Michel and I met. We’re up to nineteen years. I have friends celebrating their 40th wedding anniversaries but not everyone is lucky enough to meet the right person the first time round. 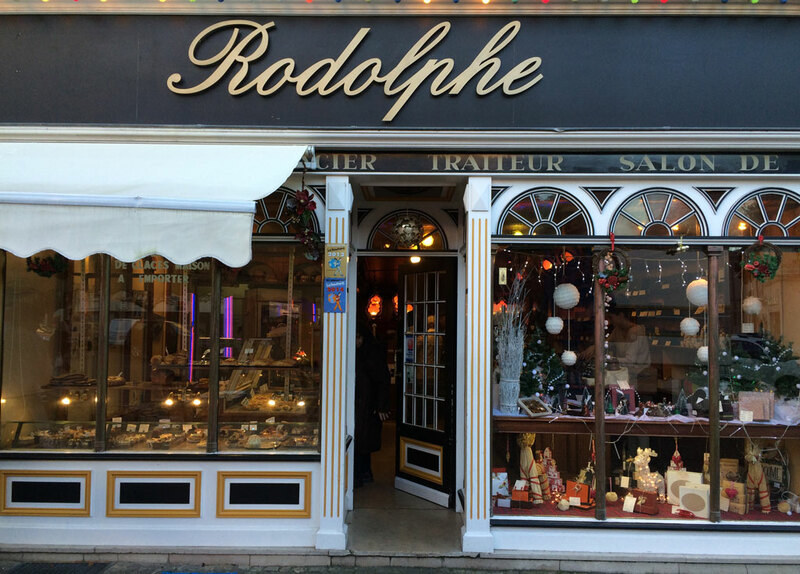 Last year, we tried out some new wave cuisine at Pertica in Vendôme but were not impressed although we did like the pâtisseries at Rodolphe’s. 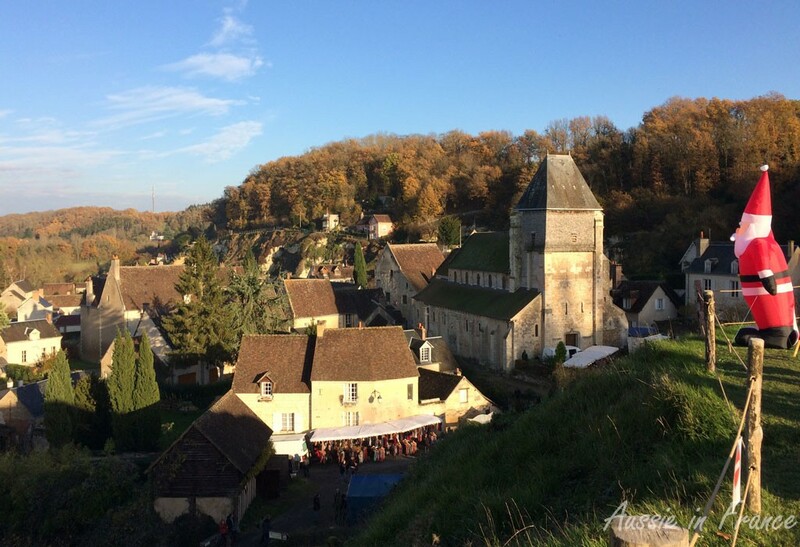 We’d also like to have a little village or a château to visit after lunch which restricts the choice somewhat in winter as lots of places close between All Saints (31st October) and Easter (beginning of April), so we’re starting to realise. 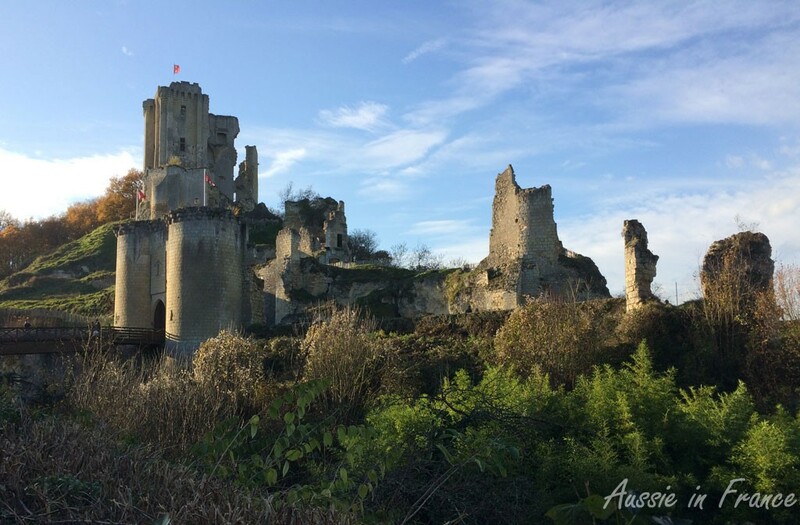 Friends have told us that Lavardin and Chateaudun are worth a visit. The only possible restaurant near Chateaudun (we’re looking for a little gastronomy here, which excludes pizzerias, crêperies and coussousseries) is closed on Sundays and Mondays. Le Manoir de Saint Quentin which isn’t far from Lavardin keeps popping up but the menu on the website doesn’t look very interesting. In the end, all the positive reviews we keep seeing (plus the absence of any other likely restaurant) convince us. We phone and leave a message, backing it up with an email. Next day we receive confirmation. 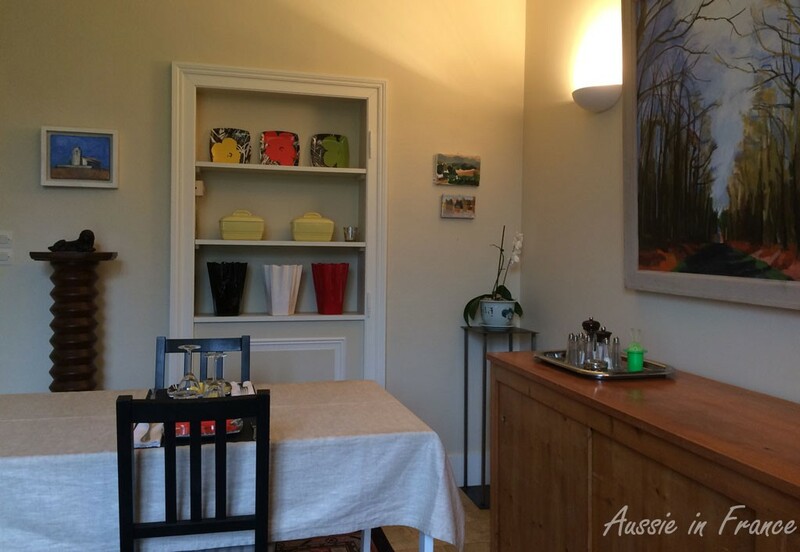 The restaurant is in a town with the impossible name of Saint-Quentin-les-Trôo. We rightly assume that it is connected to the word troglodyte as Trôo is the undisputed troglodyte capital of Loir-et-Cher. It turns out that Trôo is derived from the pronunciation of trou (hole) by English occupants during the reign of the Plantagenets in the 12th century. 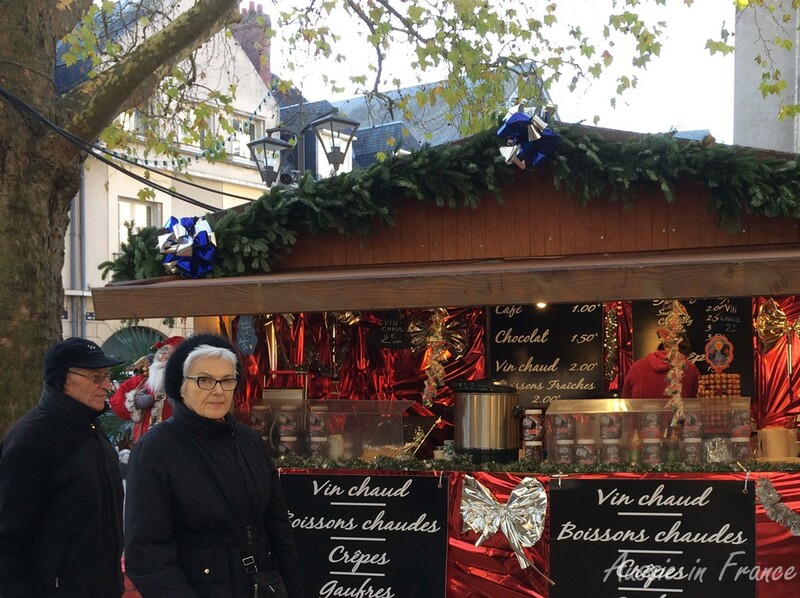 The traditional mulled wine stall at Blois Christmas market which is probably part of a chain! 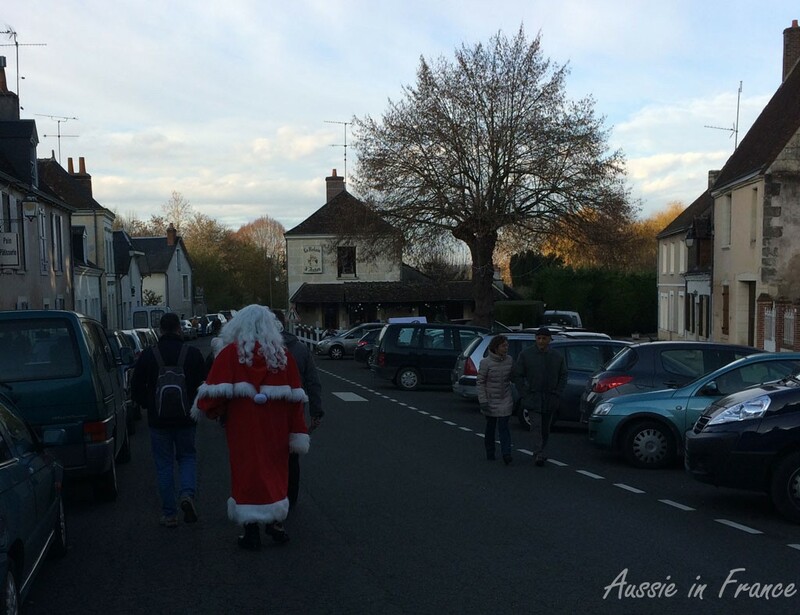 As we drive through Lavardin on the way, we see a very large number of cars parked along the road which can only mean some sort of festivity. The fact that it’s the first round of the regional elections today can’t possibly be an explanation. Sure enough, there is a marché de noël this weekend. We don’t know whether that is good or bad. Most of the Christmas markets we’re seen in recent years in Paris and the Loire have been very dismal. We arrive at the restaurant a bit early – 12.15 (it’s a little less than an hour from Blois) – and there is not a soul in sight. The weather is not conducive to staying outdoors and the door is locked so we ring the bell. A tall, harried looking Asian man answers and we apologise for our early arrival. That’s OK, he says, in heavily accented French, adding apologetically, “we’re not very busy at the moment”. He takes us through to a room where two tables are laid and we choose the one next to the window. That’s when I remember why I bought a woollen pullover a couple of years ago – it’s to put under a woollen jacket and over my Damart when we go to restaurants in the country in winter. Unlike Parisian restaurants, they are not overheated. The large radiator is on though so I assume it will get warmer as time goes by. The decor is minimalist. 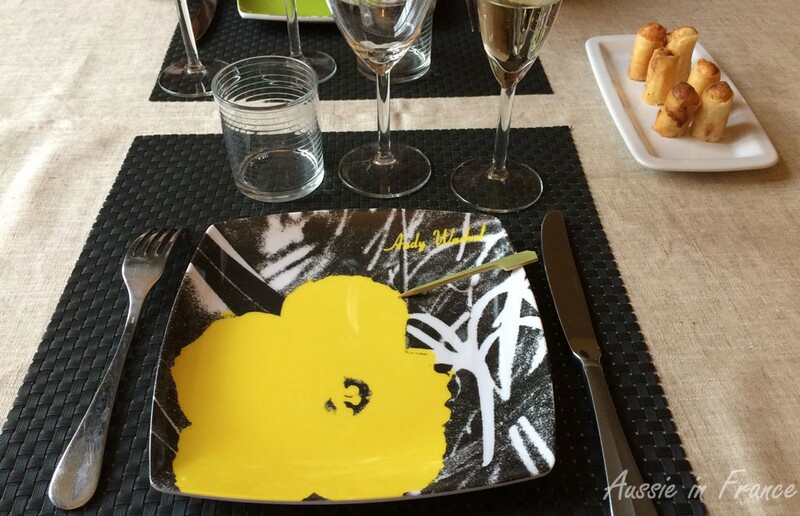 The tablecloths are plastic simili-linen with plastic woven mats and melamine Andy Warhol plates. The serviettes are good-quality fabric. There are several large acrylic paintings on the wall and some more Andy Warhol plates in a niche. There are no menus. Jean Michel orders our usual celebratory glass of champagne before I have a chance to remind him that we have decided to always order local bubbly when we eat out in the Loire Valley. Our host/chef/waiter brings back a half bottle of Rothschild which gives me the chance to change the order. I learnt the first time I visited a champagne cellar in Reims that you should never buy half bottles (even though they sell them) because the champagne can’t mature properly and develop good fizz in a half bottle. We ask for a bottle of champenoise method vouvray instead and happily stay with it for the rest of the meal. The chef, who turns out to be from Hong Kong and does not recognise my pronunciation of Cheung Chau island, tells us that he will be serving a dégustation menu. 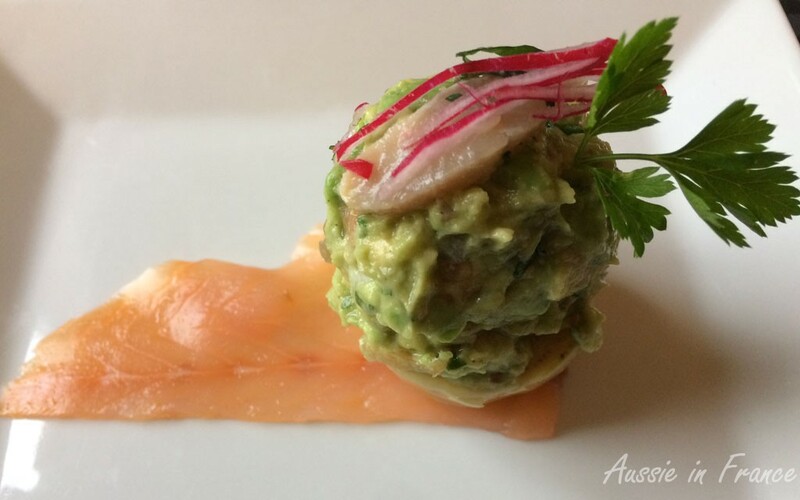 He then describes the different dishes with some difficulty as his French is a little basic. He says that cheese is optional. We say it won’t be necessary considering the rest of the menu which seems to have an amazing number of courses. To accompany our first glass of vouvray, we are given a little slice of the chef’s own foie gras on a small piece of toast, followed by some little vertical spring rolls that we don’t manage to identify. The two amuses-gueules are followed by no fewer than five starters: pumpkin soup, mackerel rillettes, cold prawns with curly lettuce, artichoke hearts topped with guacomole on a smoked salmon bed arranged to look like a snail, and foie gras which isn’t bad but we prefer our own salt-cooked melt-in-the-mouth Christmas foie gras that we’ll be making on Thursday with our friends as we did last year. By the time the main course arrives, we know we will have the restaurant to ourselves. A very tender breast of guinea-fowl is served with potato purée, turnip and carrot and a tasty foie gras sauce. By now, I don’t think I can eat another morsel. We refuse the cheese once again and wait for the dessert. Jean Michel says there are three. Fortunately they all turn out to be on the same plate. First, homemade raspberry ice-cream which we don’t manage to identify because we’ve never had it before. In France, they only have raspberry sorbet. I prefer the ice-cream. 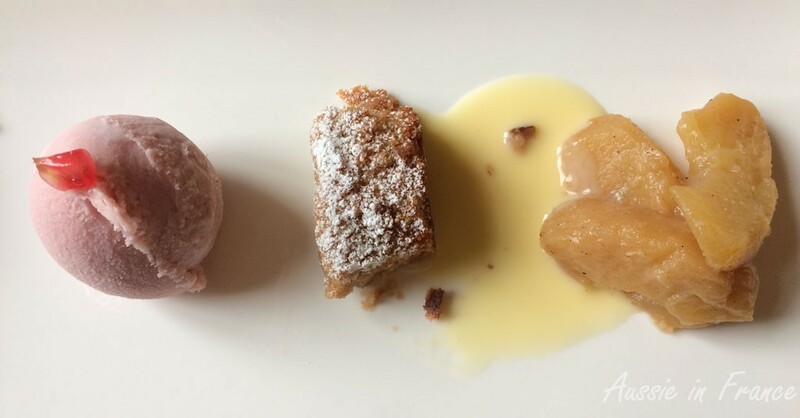 Second, a delicious chestnut soft-centred cake. Third, several lightly caramelised slices of apple. We finish off with an excellent espresso. The bill comes to 97 euro, which we declare is very good value for money (36 euro each for the menu, 20 euro for the Vouvray and 2.50 for the coffee). We’re glad we didn’t have any breakfast and are now going to get a bit of exercise walking around Lavardin. We both agree that it was an excellent choice for an anniversary lunch due to its originality. All the food is made by the chef and fresh – we even saw him go out in the garden to pick some fresh herbs; there were no strange combinations, but nothing was outstanding. The sun is starting to come out when we leave the restaurant, which is a relief. We arrive at Lavardin by a back road, which is fortunate, because it means we can park quite close to all the activity instead of miles away on the main road. 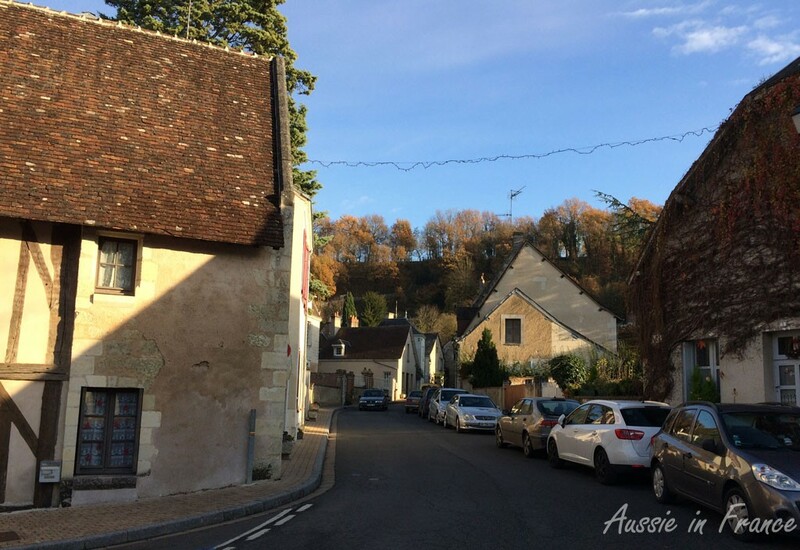 Lavardin immediately strikes us as being a pretty little town, especially with the ruined castle on the hill, 45 metres above the Loir River (not to be confused with its second cousin, the Loire). The Christmas market, however, has little to offer. The stalls are spread out through the town, including the castle, which is a good idea, but prevents us from having a proper visit though we do see a bread oven hollowed out from the limestone. There is nothing original at the market and very little is handmade. We are not tempted to buy. 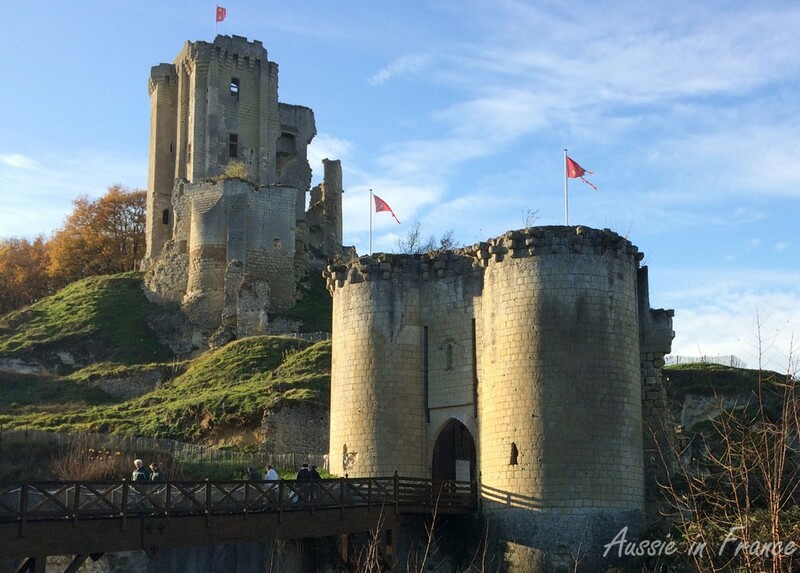 Founded by the Counts of Vendôme in the 9th century, the feudal castle was rebuilt in the 14th and 15th century by John 1st of Bourbon-Vendôme. After being occupied by members of the Catholic league, it was captured and dismantled on the orders of Henri IV in 1590. All that is left of the castle is a 26-metre high ectangular keep with flat buttresses topped with crenallations. The only remaining part of the two walls built in the 14th and 15th centuries is the entrance flanked by two circular towers and a drawbridge over a moat. We walk up the hill to the castle and out onto the promontory. Unsurprisingly, the blow-up Santa Claus does not seem to appeal to many of the children present. A couple of teenagers try to hug it while their mother takes a photo. And somehow, I can’t really imagine that the real one with his terrible white dreadlooks sauntering down the street talking to his mates is very convincing either. However, Lavardin certainly has potential. We’ll come back on our bikes in the spring and cycle around the area, maybe starting in Vendôme, less than 20 km away, as there are several places to visit, including nearby Montoire-sur-Loir, the manor house where Pierre Ronsard, the Renaissance poet, was born, the historical train station in Montoire where Pétain and Hitler met up during the second world war, the Saint Gilles chapel with its beautiful frescoes and the troglodyte village of Trôo. Perhaps you’d like to join us? 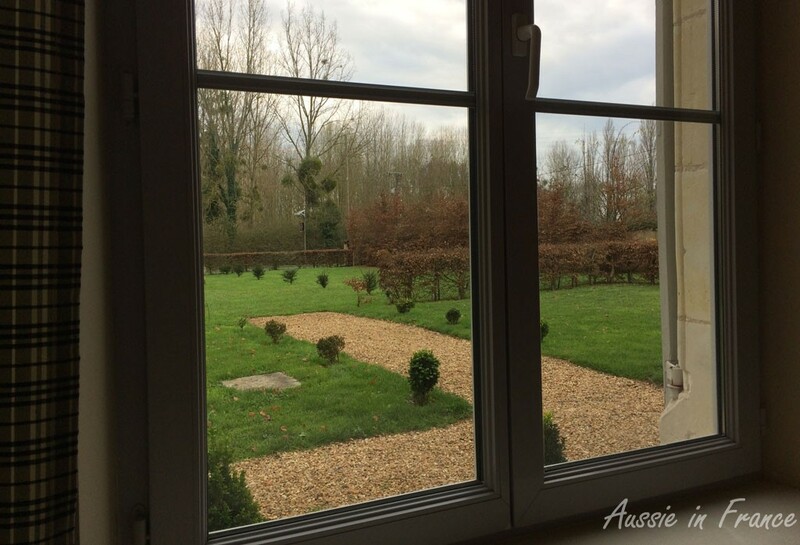 This entry was posted in Cycling, Food, Loire Valley, Restaurants, Wine and tagged lavardin, manoir de saint quentin, montoire-sur-loir. Bookmark the permalink. Bon anniversaire de marriage ! Interesting that you enjoyed the sparkling vouvray. 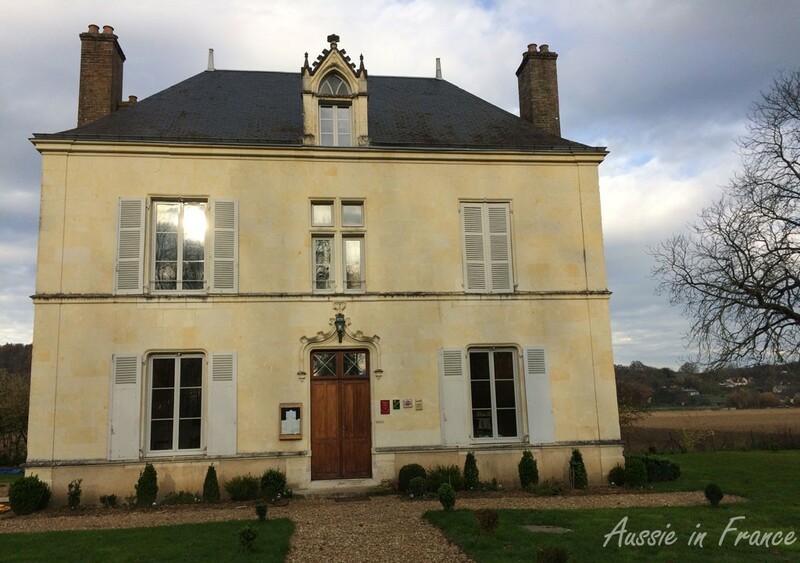 My husband’s cousins in Montlouis-sur-Loire used to produce the local vouvray wines. 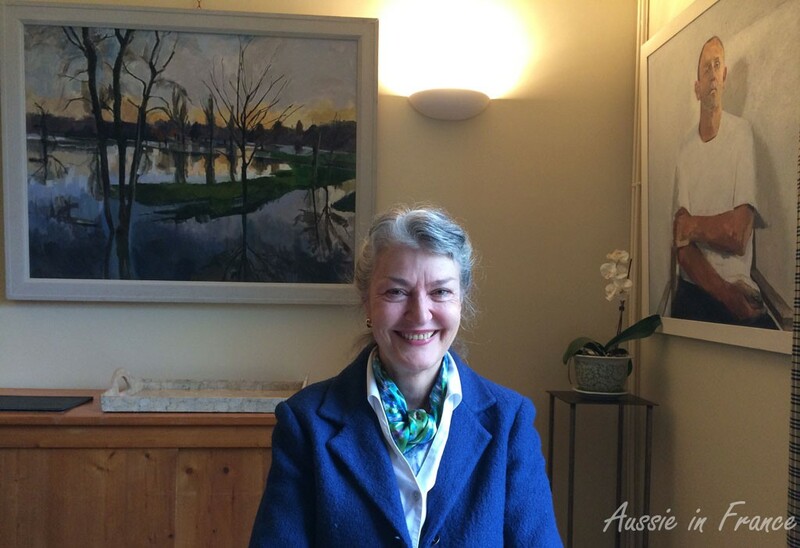 I was a little bit surprised to read that your husband’s cousins in Montlouis used to produce vouvray as vouvray today is an appellation d’origine contrôlée (AOC) which means that it can only be made in the immediate vicinity of Vouvray. However, I checked and this is what I found. For several centuries, the blanc de Pineau grape produced on both sides of the Loire, in Montlouis and Vouvray, was called “vin de Vouvray”. It was only when the AOC system was created that Montlouis, aware of its originality, became independent and became a separate AOC. Well,thank you Krysia, and I’m so pleased you have been enjoying the blog. Happy Christmas to you too! 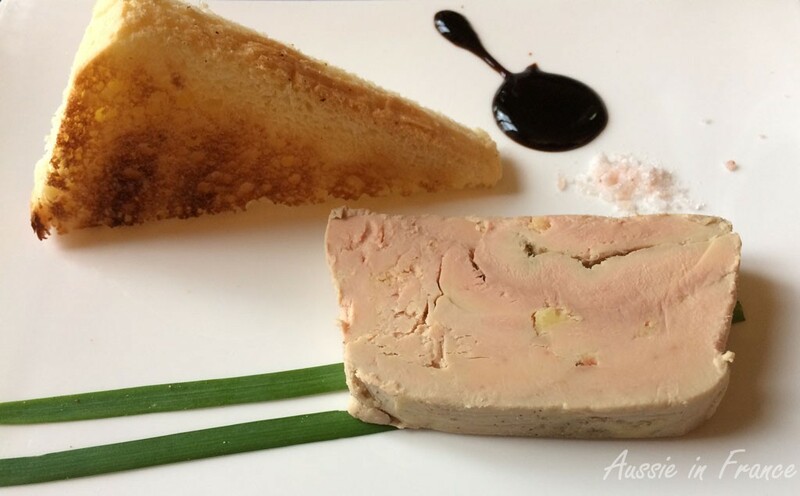 I picked up our fresh foie gras yesterday afternoon. Had an interesting conversation with Mme Charcellay re bird flu and the new animal welfare legislation. Lavardin is on my list of places I would like to visit, mainly because of the wall paintings. I didn’t realise that apart from being generally pretty, it had other significant attractions, so I’m even keener to visit now. Shame it’s just a bit too far for a nice day trip for us. 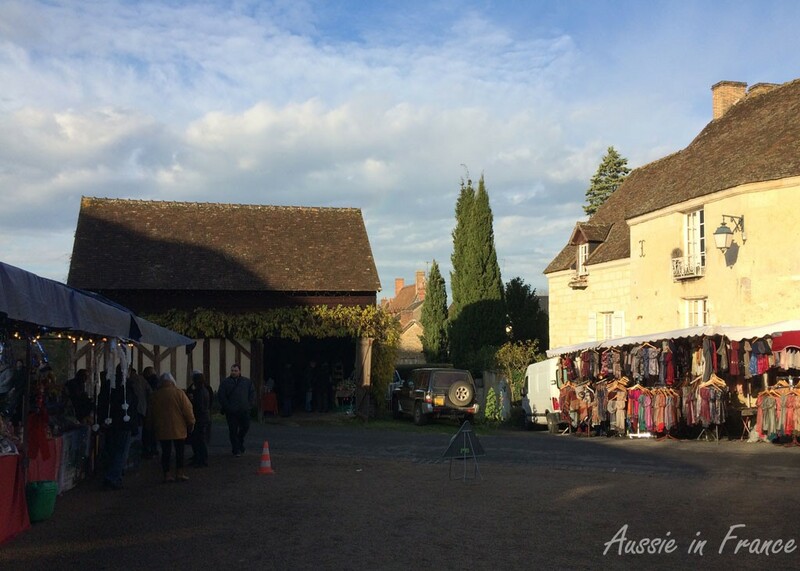 Our Christmas market in Preuilly was surprisingly good on Saturday. It was small and didn’t look like much, but there were some very good local producers there. I bought some chocolate hazelnut spread from a very nice and interesting young man I haven’t encountered before, as well as some honey. The weather was absolutely perishing though. Thank you for picking up the foie gras! 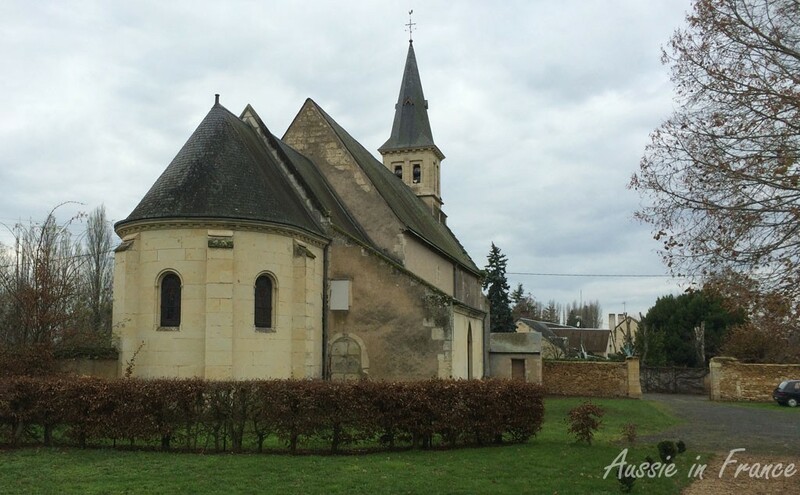 Yes, Lavardin isn’t far from Vendôme. A friend has often mentioned it and we didn’t realise until we got home how many other places there were to visit. We were a little put off by the Christmas market. I’m glad to hear yours was better. We had good weather on Saturday. I am so glad that your meal was such a success. Whatever next – a Chinese chef receiving accolades for his French cuisine! No, I had never seen a Chinese chef in a French restaurant before and initially assumed he was Japanese. I’ve been reading on English castles, so the terminology’s quite fresh. I like this one. I hesitated over the use of machicolations as opposed to crenellations but wasn’t sure about the difference. We don’t have castles in Australia :). Happy anniversary. Your photograph shows how happy you are. The blue sky, autumn leaves and castle make me want to join you in spring. Yes, we were so happy when the sun came out. Everything is always so much better with a blue sky! It’s great to have a few anniversaries ‘up your sleeve’ and the day you met sounds like a good one. We have them as well and include the day the dog came to live with us – as well as his official birthday according to the Vet (best guess when he was found) and his honorary one that comes halfway between ours.